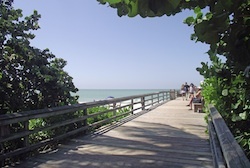 Naples, Florida with its beautiful white beaches is truly a little slice of paradise. Located on the Gulf of Mexico, Naples has clean white sandy beaches that stretch for miles and a diverse cultural mix of residents. Downtown both 5th Avenue and 3rd Street have a distinctly cosmopolitan ambiance. As the Premier area in South Florida to live, Naples is known for its beautiful beaches, warm gulf waters for boating, fishing or just relaxing in. There is also wildlife in abundance in the Picayune Strand Preserve with over 80,000 acres to ride horses in. Naples has it all, there are homes here to suit every lifestyle, many of our residents also have homes up north, but winter down here either in their own Naples Florida vacation home or in a rental home in Naples Florida. The metropolitan city has been growing since the 1980s. Naples is home to hundreds of housing developments, both old and new, there are a variety of new single family and multi-family homes, villas, as well as high rise Condos with amazing views over the Gulf of Mexico. Naples offers many different types of living, from Luxury Homes, to family orientated and everything in between, many communities include pools, golf courses, tennis courts and fitness centers. The homes for sale in Naples range in style from Old Florida homes to luxury Mediterranean oceanfront villas, condominiums, carriage homes and of course apartments for rent, many of them as winter vacation homes, often Winter Snowbird vacationers decide to make Naples their permanent residence. Many of the communities are styled around specific lifestyles like Golf or Tennis, Boating, or nature preserves. With the warm Gulf of Mexico waters and great fishing, the opportunity for great boating is what draws a lot of people to the coast of South Florida. Naples has harbors, docks, homes on canals that lead directly to the Gulf waters, together with boat condominiums to store your boat out of the water. Visit Marco Island by boat, or go up the coat to Fort Myers Beach, Wiggins Pass is centrally located, the City Docks in Olde Naples is a quaint location to visit as well as Tin City, which you can get to by boat and land, take a leisurely lunch at one of the many restaurants overlooking the water and watch the fishing boats come in. If you don't own a boat there are boats for hire, take a sunset cruise on the Naples Princess, or charter a private fishing boat and let the captain show you where to go for the best fishing in the Gulf of Mexico. Then there is the Philharmonic Center for the Arts, which has been renamed to Artis-Naples where you will find some wonderful productions, check out their website for upcoming entertainment. The Sun and Fun Waterpark is a great day out and Naples even has it's own Zoo! There is a lot to consider when moving to a new location, if you would like more information or just to chat about homes for sale in Naples, Florida, please, feel free to call us, we live here and have a great understanding of the area and its lifestyles.